Woot! Woot! Got June block done before the clock struck midnight! And, now tomorrow I'm on to July! 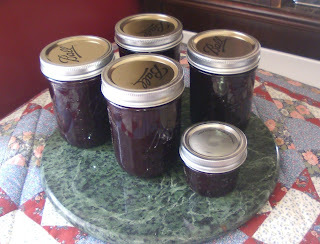 I never really know the answer to this question when I try to make fruit jelly. Sometimes, it turns out just great...and other times not. So, tomorrow, we'll see what I get.For now, the plums that were picked off the fruit trees and put into the freezer this past month...can now be used on toast...or pancakes....depending on how they turn out. 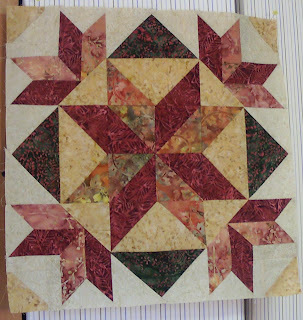 Finally, got the block done for May for the HGTV Block of the Month. 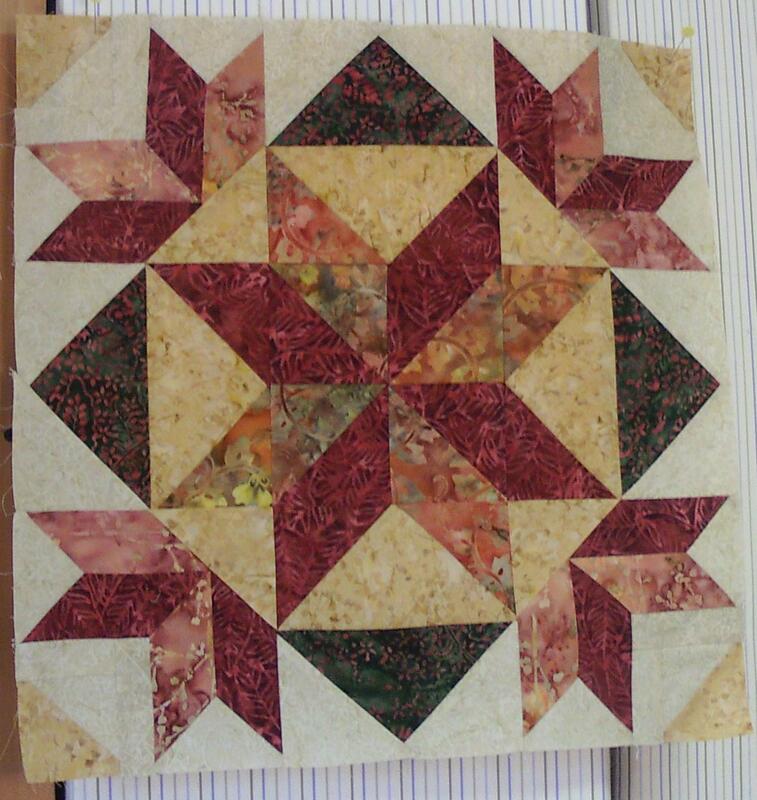 Actually, (embarrassingly) this is the second time I pieced the block. 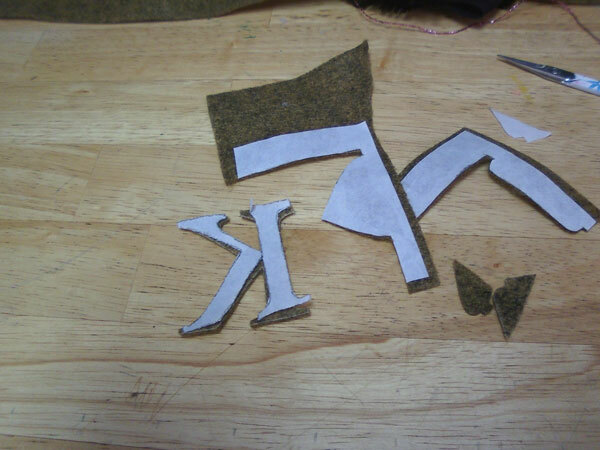 The first was cut wrong and did not go together at all. This one is better, but not perfect...and will become a pillow. Nine of the twelve blocks will go into a bed quilt, and three will be pillows. So, this will become the first of those pillows. Now, if I can get the June block finished today, I'll be caught up! I started with Arlene's Beetle Class this past week, and decided to try my hand with a white beetle for my CQJP blocks. 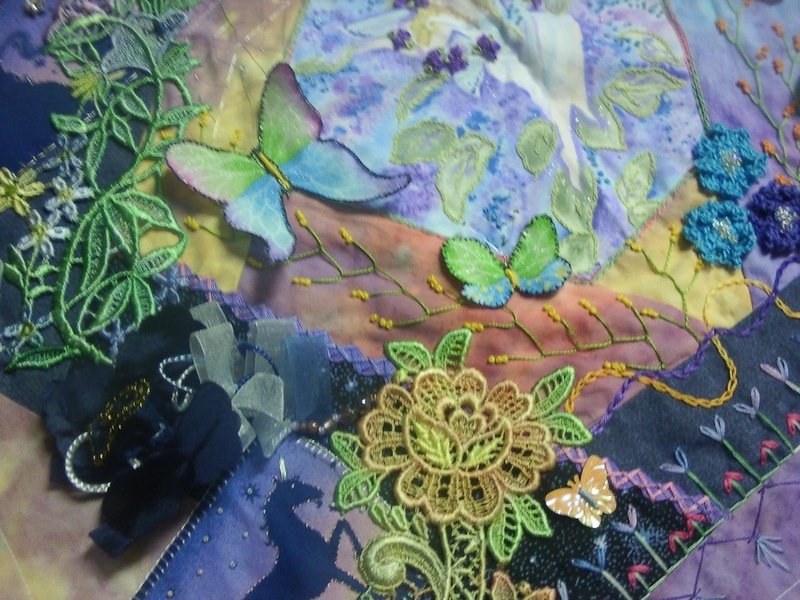 The wings were supported by wire between two layers of organza. This was not the way my instructions has suggested...but one layer was too thin to stitch through, so I added a second layer which made me working with an organza sandwich! Leave it to me to make everything "different"...but, I liked the idea once I got to stitching. The wraps for the wire were tedious...again because of "my adjustments" as I decided to use regular sewing thread in white to do this with. Do you know how many "wraps" it takes to cover these beetle wings wire? A LOT!But, I still think the effort was worth it. I finished by covering all the organza with beads, on the back side I glued a thin layer of Angelina Fiber so I would not see all the threads from my bead work.Next week we create the beetle body...so there will be more to this after that lesson.I recommend Arlene's class...the instructions are detailed and not difficult to understand...and she allows you the flexibility to adjust and apply your own Artistic Style...which I love!So, watch for her classes over at www.joggles.com if you are interested in stumpwork of this type. 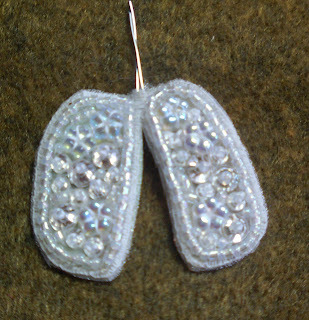 It's hard to photograph white on white....but, these babies really sparkle in real life! 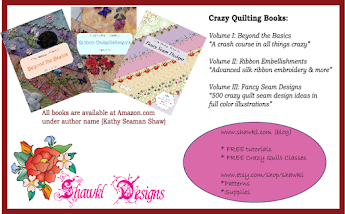 Crazy Quilters International, a great Yahoo Group for crazy quilt round robins has a Fab First Timers swap that is always going on. It's for anyone new to the group to just get their "feet wet" so to speak with their first round robin.Recently, the 22nd round robin was set to begin when a signee had to drop out. That left the others in the swap waiting until another "newbie" would come along to join. 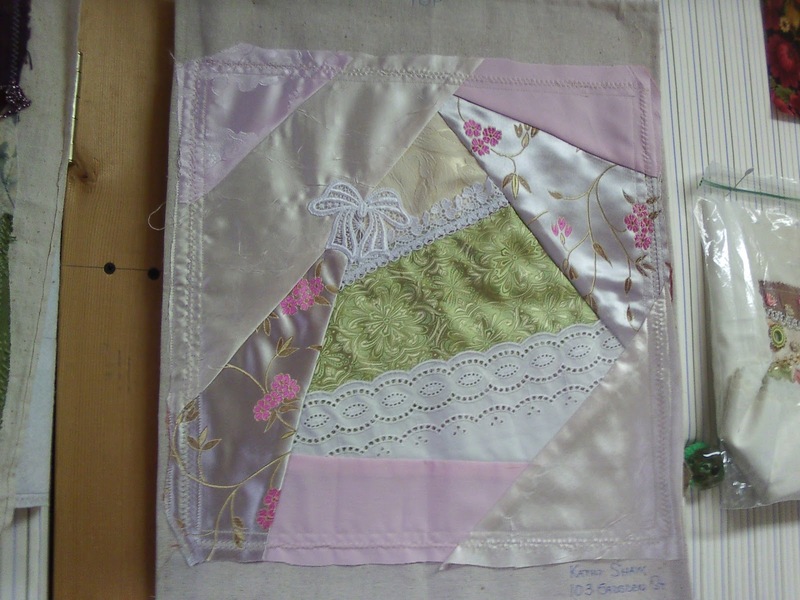 So, to keep them from having to wait longer...I signed up for my second FFT...although it is number 22 for the group.This is my starting block, and I can hardly wait to see all the wonderful stitching that returns home to me. 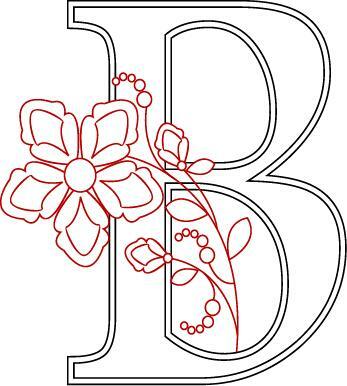 I've already checked out a couple of the ladies blogs and am eager to see their work close up.Aren't cyber groups wonderful! Especially when you find a good one! 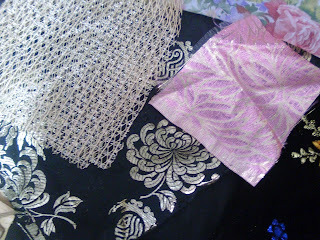 Just wanted to share that I have a new class available at Maureen's Vintage Acquisition website. 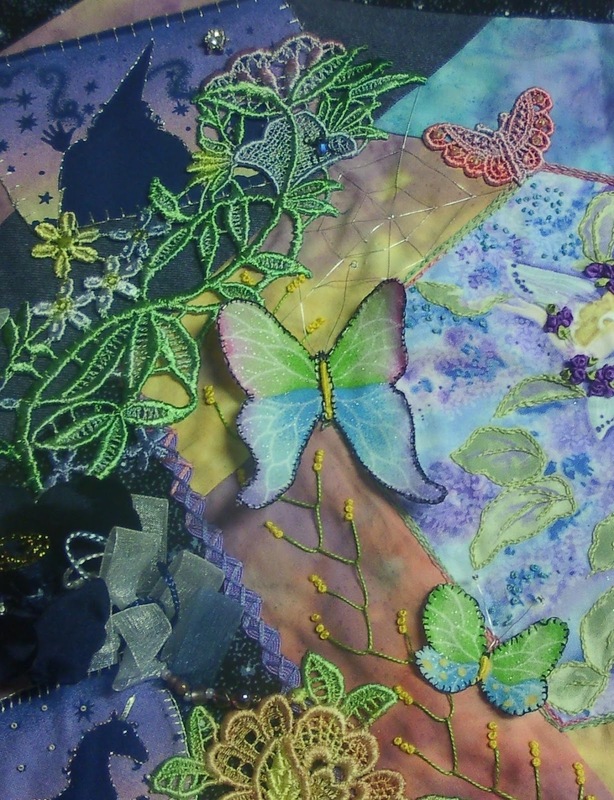 It is the first in a series that I'm calling my Rose and Lilac Collection. 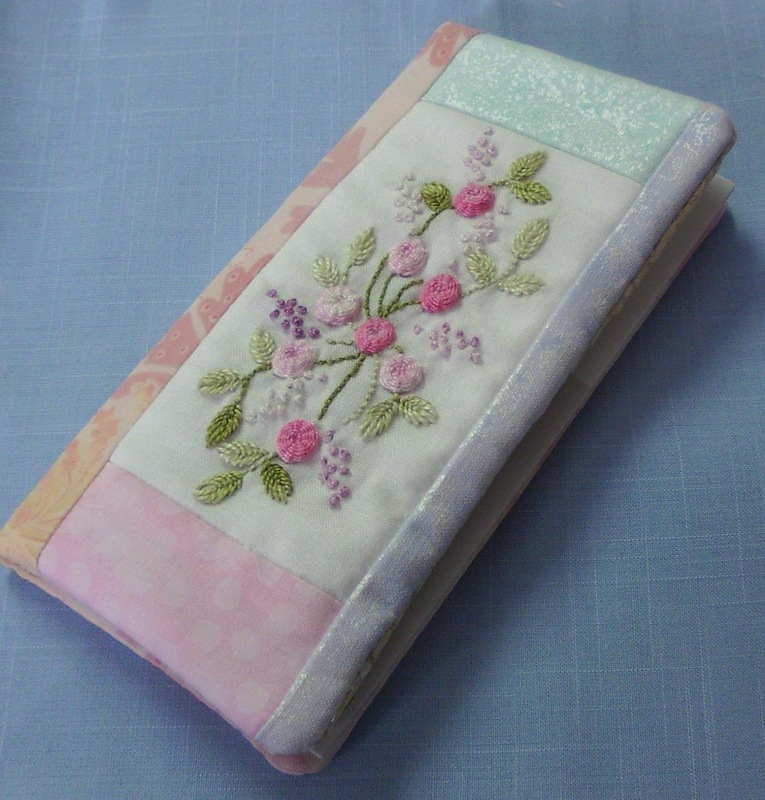 The entire collection will be several organizational items...for sewing, crafting, and personal use. Each will have a different embroidery design of roses and lilacs...so all together you can create a lovely collection of beautiful and functional organizational items. This first class is for a mini-wallet and checkbook cover set. 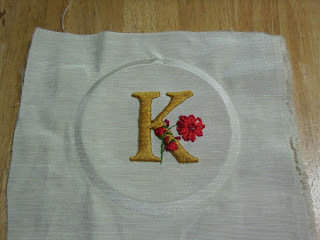 These are both super easy to embroider and to assemble. Only general knowledge of basic sewing machine skills are needed (or you could stitch by hand if you prefer). 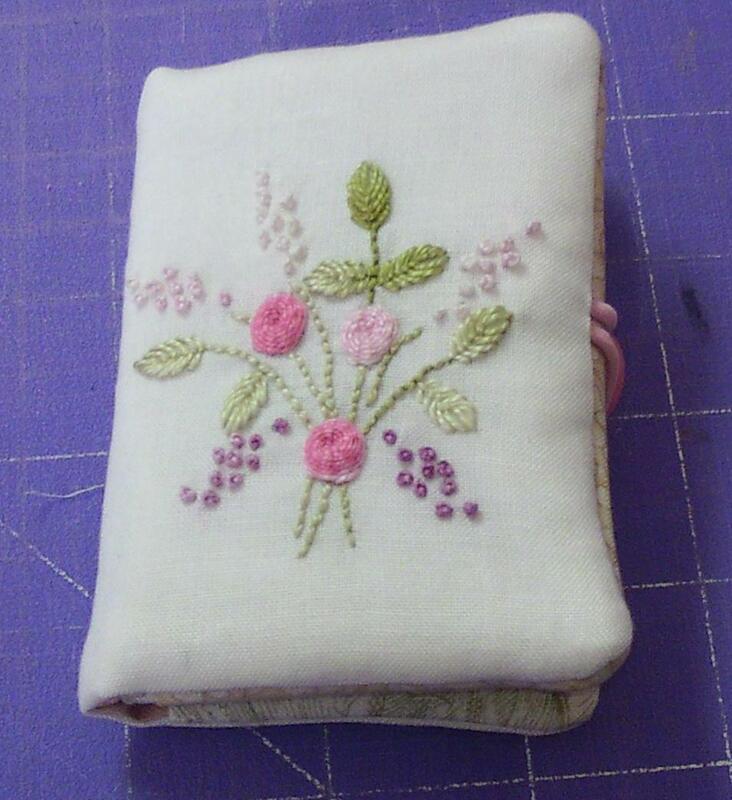 The embroidery is very basic so that beginners can create the designs with a little practice. Of course instructions are complete...and detailed.This is the first class of the series that I've completed the instructions for...but hope to have the series finished and available by the end of the fall. This mini-wallet and checkbook cover set is identical in style to what I carry every day...and love them! Except, my current ones do not have this gorgous embroidery on the front...so, guess who is now changing them out for these!Both of these items are small enough to only need scraps of fabrics to create...and the class cost is set at $15...so that anyone can join in the fun without a major cost requirement. These make great Christmas and Birthday gifts...or just do several in different colors to use yourself! They are completely washable and very durable. The class can be taken anytime, no special registration period. 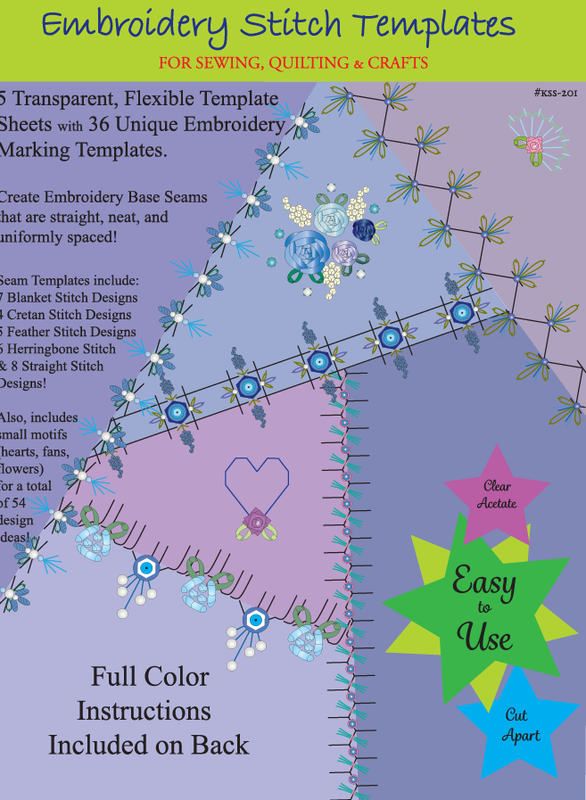 Full color embroidery designs are included for the wallet and the checkbook cover with step-by-step easy assembly instructions too. Hope to see you in class! Got my little doll quilt sent in this week...to the HGTV Message Board as part of a coordinated effort to support the "Get Your Clause On Project" that Debbie has posted about on her blog, Stitching Therapy.If you have not ever heard of this project...and like working small quilts...check out the blog link.It is wonderful fun!Especially, if you work with your own group...as the HGTV ladies have...to coordinate many quilts to send in all at once (Thanks Nicki...(nlk). )My little quilt is only one of more than fifty...done by the wonderful quilters over at HGTV Message Board. Hugs ladies!! Here's another monogram design for you. 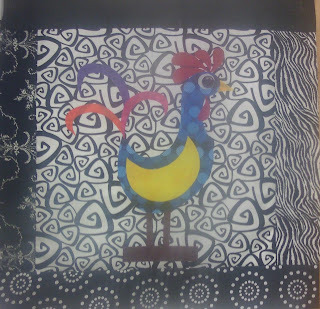 I have one of these designs traced, and hope to get it stitched this weekend. But, right now...I've got other things on my plate. Unfortunately, non-stitching things...like garden tasks, house-keeping, doctor's visits, and helping my family in some remodeling tasks. But, we'll see what else can be accomplished...stitching just needs to be done! Hugs! Hobby Crisis! Can You Help? 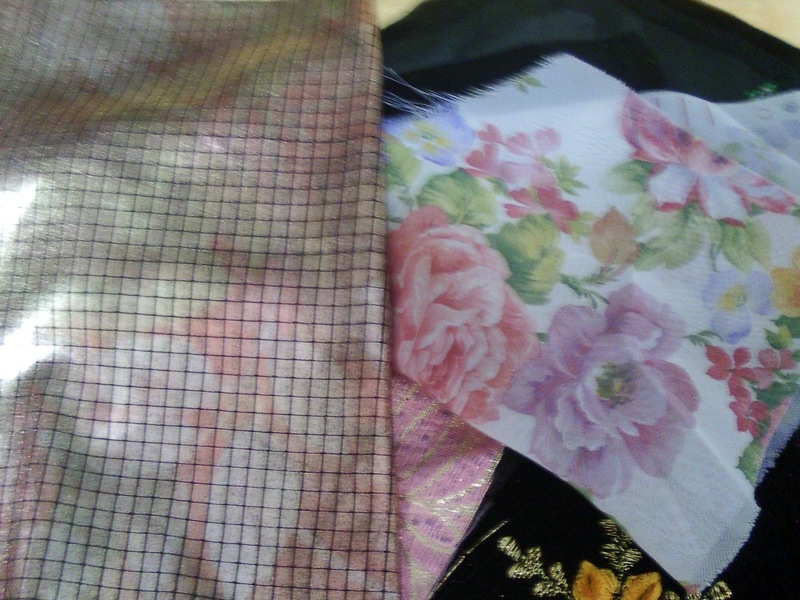 I need this fabric! Have you seen it...who makes it? What is the name of the fabric line?Do you have any of it yourself...that you'd be willing to sale?I am just sick...because it is the main fabric in a quilt top and I can not find any more of it in my stash...even though, there is supposed to be about 3 yards here.This is one of the fabrics...the main one...that was provided to the HGTV Ladies in the Row-by-Row quilt swap. 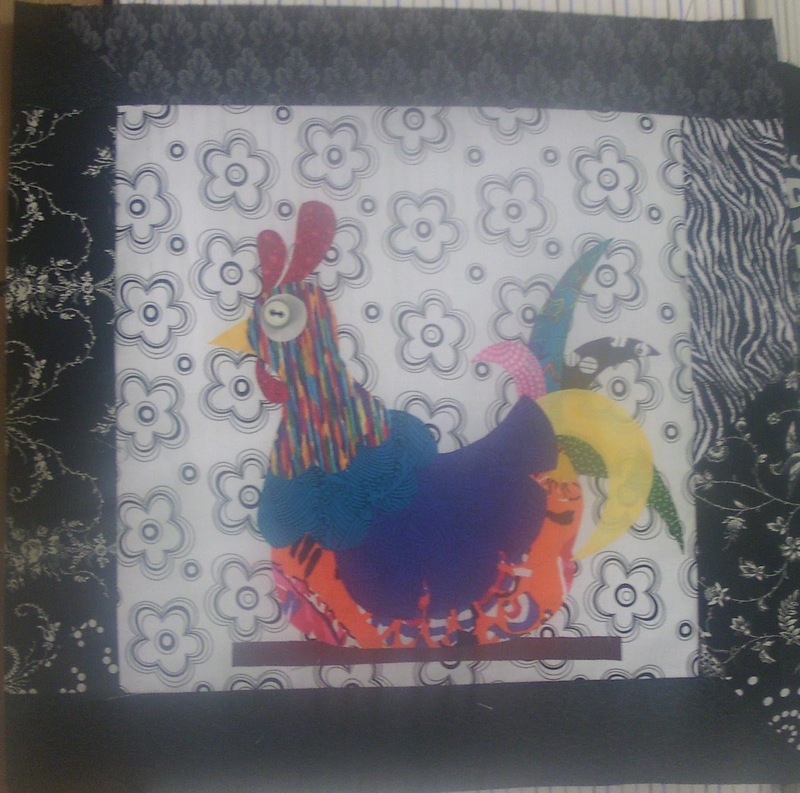 And, in September...I'll be getting my quilt top back that they have sewn...using this fabric as the main focus fabric, as I had requested. 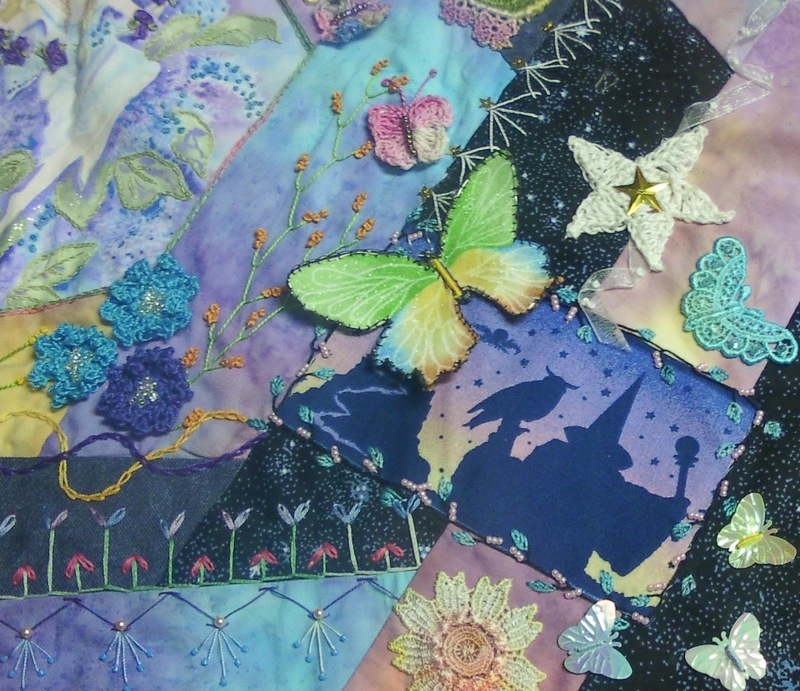 (I've been working on a quilt for each of these ladies each month to...based on their own fabric choices. 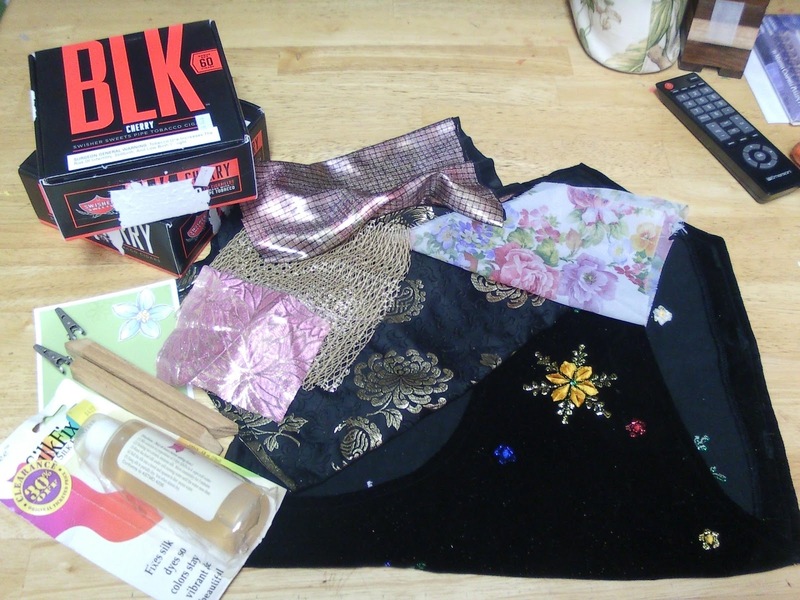 )When we began this Round Robin the first of the year...I gathered my fabrics, created my first row of blocks and send everything off to the next lady in line. 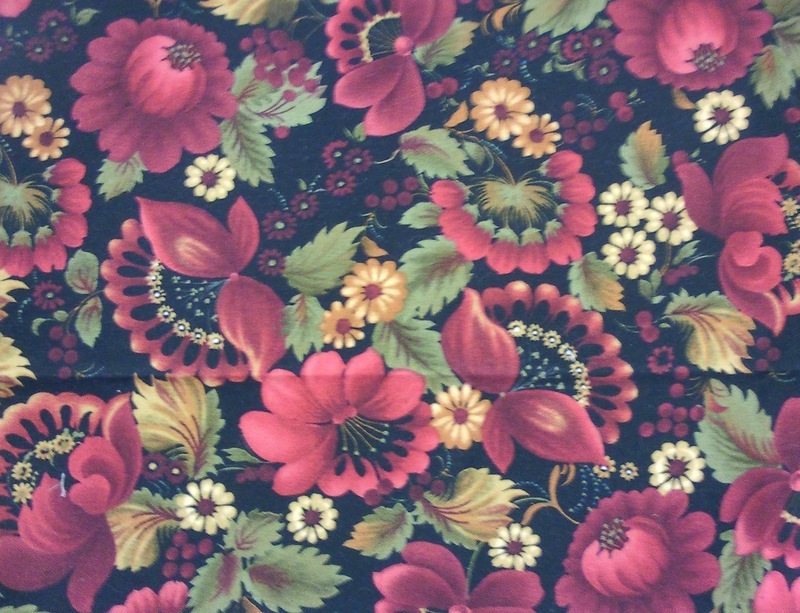 I kept 3 yards of this fabric to use as a border when the quilt top returned.I have searched and searched...it's no where to be found. Now, I don't say that lightly...believe me, I've been going through every box, bin, plastic container, dresser drawer, and cubby hole up here in this garage apartment...and below in the garage too. I offered to pay my SIL if she could find it and gave her free reign...she searched and searched...pulled out everything from every drawer, box, bin again...and we can not find it!Seriously, I have now idea where else to look!I really need this fabric...or my quilt will have to have a solid black border...but...I have no idea when I purchased it...or from where. 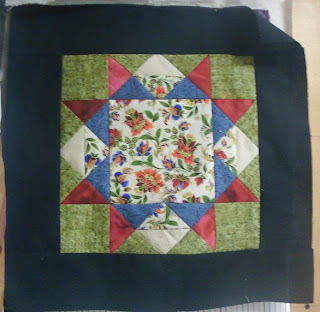 Don't know who made it because all I have left is this little piece which was returned as scrap with my other un-used fabrics in the Round Robin. 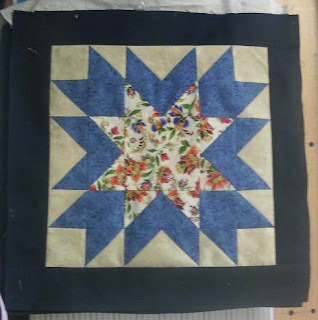 (Although we don't see our Row-by-Row quilt tops until the Retreat in September...I did get my left-over fabrics back from the last stitcher working on the round robin. 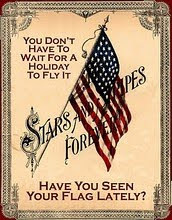 )So, I"m at a complete loss...sure hope someone out there can help me out! Post Script: Nancy, a cyber pal over at HGTV Message Board, is sending me fabric that she believes is a perfect match! 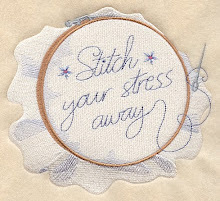 Oh, I sure hope it is...as my worries would be over! Aren't friends just wonderful...and especially those that we've never even met! These are extra special to my heart! Yesterday, I managed to get caught back up on my funky chicken blocks.These are from the Block of the Month patterns over FatCat...she posts a new one each month, free...or you can purchase the entire set. Sorry the photos are so strange...but I think there is dirt on my camera lens. Gonna go check that out right now....hugs! 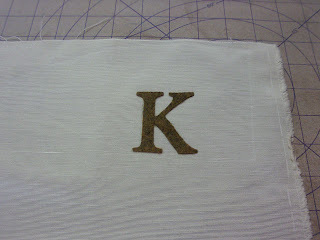 Today, I'm starting a new monogram series. The title is Five Petal because...obviously, the main floral has that design. 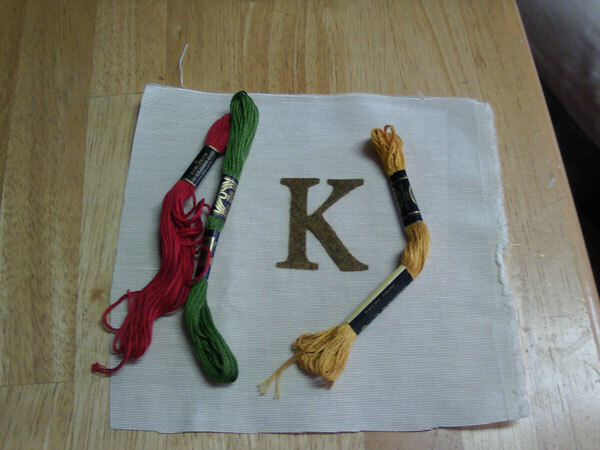 Try these in larger sizes for great fabric/felt letters and embroidery flowers (I'm working on one now, and will of course share when it is complete.) 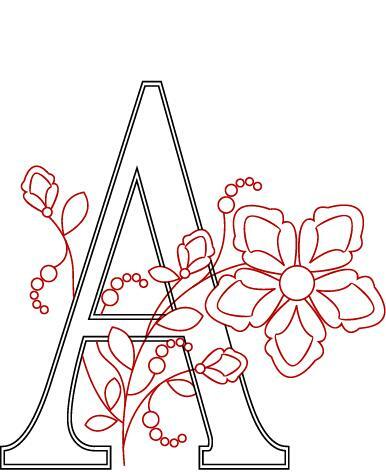 The last two series of monograms got a little tricky for me to keep up...so this time, I'm just going to begin at "A" and end at "Z". Hope you enjoy the entire alphabet! This is a little late in posting...but I wanted to publicly thank my dear friend, Eileene, from Arkansas for a nice little surprise received in the mail last week. 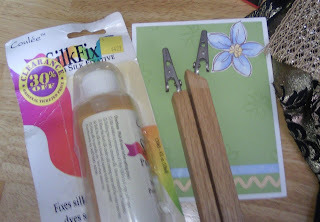 silk "fixative" and alligator clips to be my "extra hands" for holding threads when making cords for tassels. Even the little tobacco boxes that held all these goodies will be used in craft projects with Aidan.Thank you again Eileene...you are always a surprise! Sending big hugs girlfriend! !Stay cool! Working on a little ornament...here's the progress so far. To start, here's the general layout. 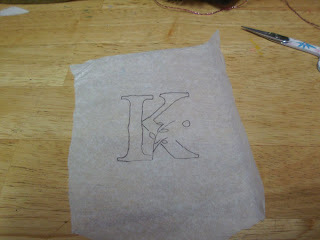 Only the letter and the flower stems are put on my tracing paper. Then a reverse image of just the letter is traced on to paper-backed fusible web...I use Heat'n'Bond brand. 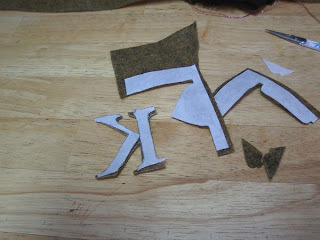 This is ironed to felt, and then cut out. The felt letter is then ironed to my piece of background fabric. I'll be using regular DMC 6-strand floss in colors #3346, #783, and #1100. The felt initial is a base, to be covered with satin stitch embroidery. 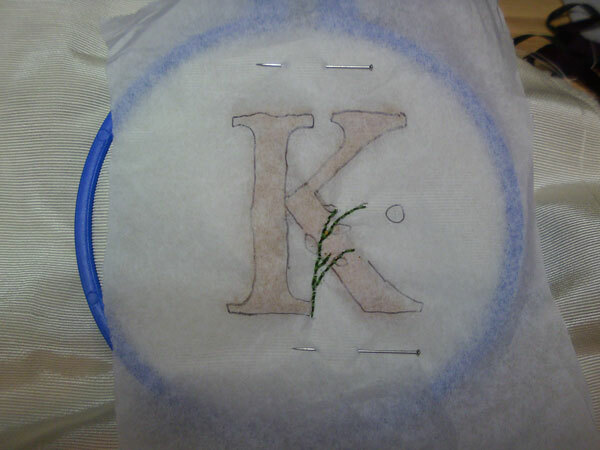 I like to stitch some parallel lines of stitch to "try" to keep my satin stitch all going in the same direction. I never succeed at this to my liking...but I just keep trying to perfect my work by practice. 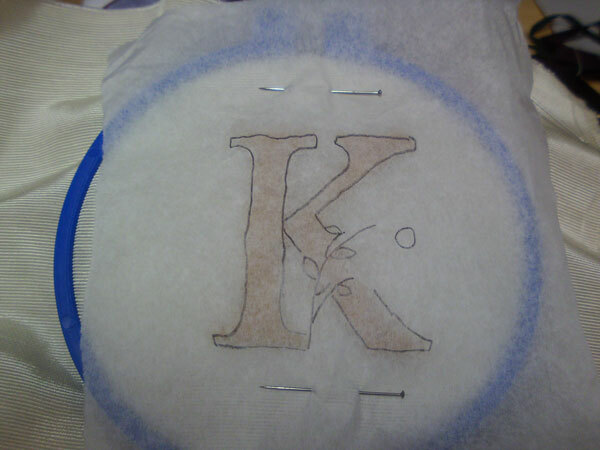 After the letter is stitched, I cover it with my tissue pattern....just using some pins to hold it in place. 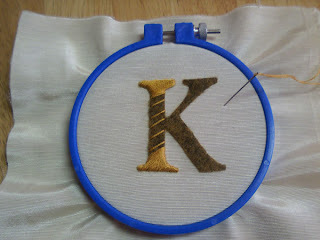 Then, I stitch the stem. I was going to stitch the leaves too, but decided to just free-hand those instead.The tissue paper is torn away, and the little "bits" remaining are removed using some blunt tip tweezers...held parallel with the fabric. I also use a straight pin to "wrinkle up" pieces that are stubborn and don't want to come out from under my stitches...this makes them easily removed with the tweezers or a piece of sticky back tape. 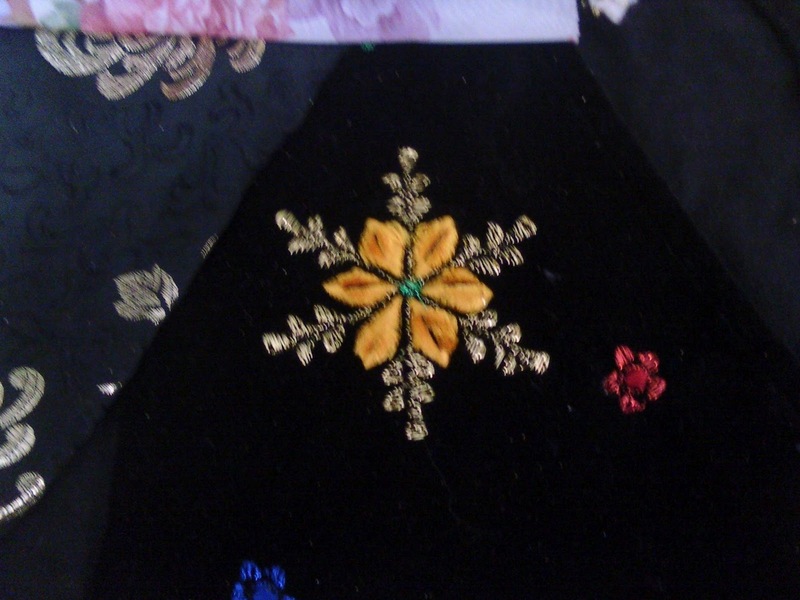 Lastly, I add some French knots with the red DMC...and some detached chain stitches with a little red 4mm silk ribbon.Next will be to create the back of the ornament and assemble it. I'll be back with that when it is accomplished. I've had Lorrie's block at my house for over a month. It is a bit larger than normal, but I like large blocks...so I'm okay with that. 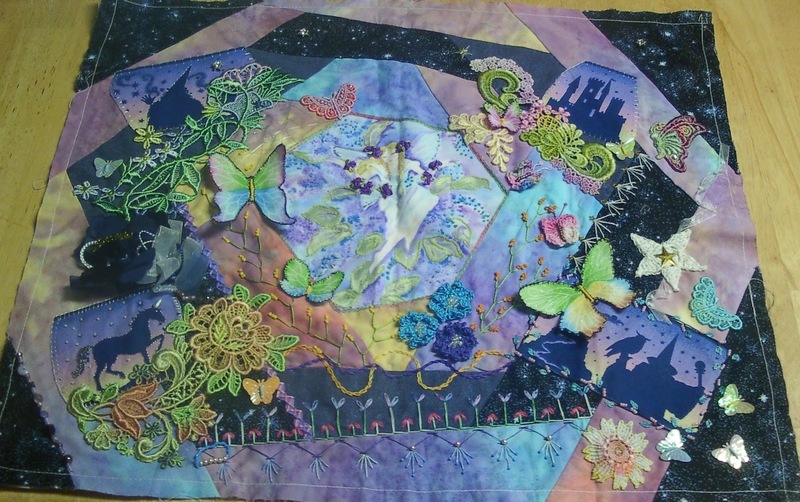 She asked for several things...and the hardest was to use some provided fabric to create 3-D butterflies out of. Since I was the last in the robin...and the other ladies smartly opted out of this request...it was up to me to give it a try. Lorrie, I did my best...but feel free to redo every one of them if you like. It was not my "cup of tea"; even so, they do seem to be happy on the block. 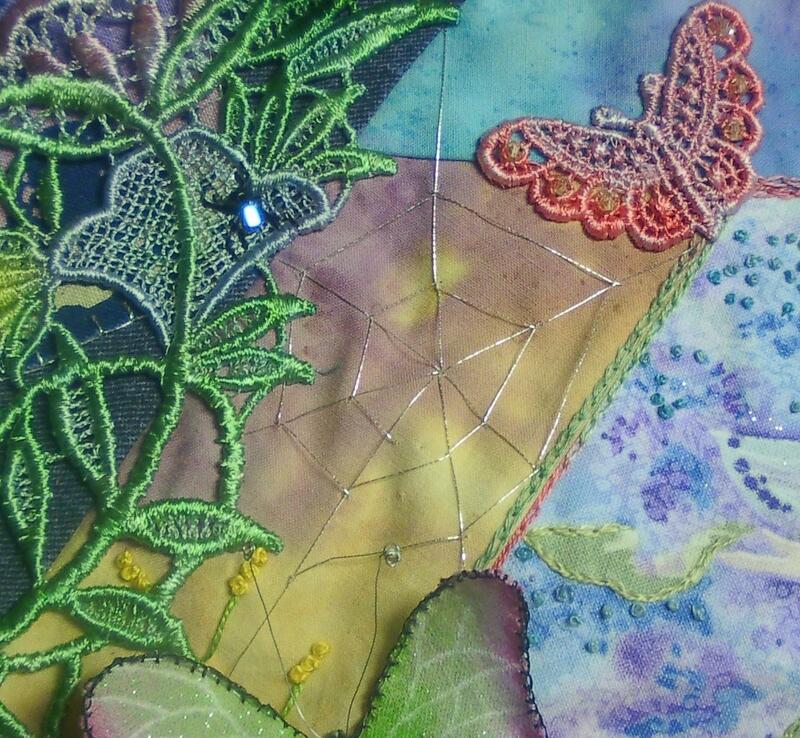 and my favorite fan stitch.Mostly, I added several florals in hand dyed lace to bring tons of texture and color to the block.Then, butterflies by the bucketful...and crystals/beads for some magic. 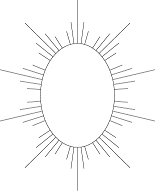 Have you ever tried to stitch a perfect little sun...with rays? I know that I have, and it's hard to draw a pattern with all those rays aligning perfectly. Well, here you go!And, as an oval...this little design makes a really cute frame!